We believe, with great pride, that craft beer is an attitude and that flavor favors the bold. That bold attitude is what led us to imagine the Hopffalo as the perfect symbol for our mutual pride of place and love of craft beer. Inspired by this chimerical creature we liken each style we brew to a vast frontier of flavor begging to be roamed. Suffice it to say, we’re good and proud to call the Great Plains home. And prouder still to brew plain great beer. Follow the Hopffalo. Never one to shy away from an adventure, Alex Briner's thirst for quality craft beer has taken him from home brewer to Head Brewer. With ten years of honing his craft under his belt, Alex is as much the braun behind the brewhouse as he is the brains behind the beer. Contact Alex by email at alex@prairiepride.beer. We're firm believers in the third place. Somewhere to talk shop after leaving the shop, and to feel at home before heading home. Communities are built around such places. And what better way to come together than around a few pints of locally crafted beer. Centrally located in the heart of Grand Island's Railside District, our taproom is the perfect place for an impromptu rendez-brew. Man cannot survive on beer alone. Trust us, we've tried. Yet, as a production brewery our menu is limited to 15 kinds of liquid bread. That said, The Wave Pizza Co., as well as a few others, will deliver directly to the taproom. Not to mention, we encourage you to BYOF (bring your own food). Just don't forget to share. Friends don't let friends walk away empty handed. Bring home some Pride with either a 64 oz. growler or one or more of our 32 oz. Boston rounds for a variety of your favorite fresh beers. We recommend drinking within 48 hours of opening for the best flavor. We're always here for refills. After all, fresh beer is the best beer. With over 1,000 sq. ft. of flexible gathering space our taproom features an incredibly unique environment with a warm and cozy atmosphere. Oh, and did we mention we offer beer? Add on a brewery tour or a private tasting for a fun and unforgettable experience. 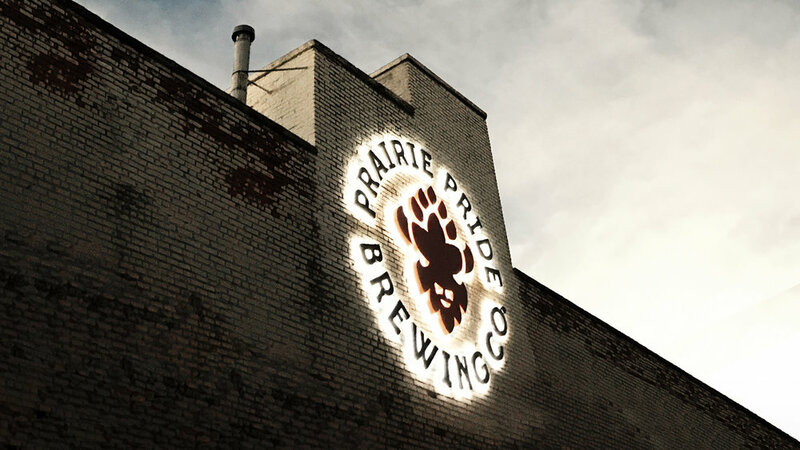 For scheduling inquiries and info please e-mail alex@prairiepride.beer. Please contact Alex Briner by email at alex@prairiepride.beer.